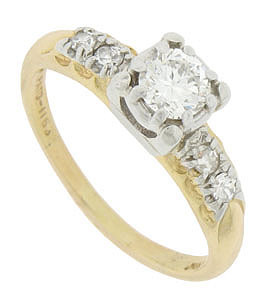 This classically styled 14K bi-color engagement ring is set with a .30 carat H color, Si2 clarity round diamond. Two round faceted diamonds set into the rings shoulders flank the central stone on either side. A white gold central mount and frosting on the rings shoulders adds sparkle to the luminous diamonds. 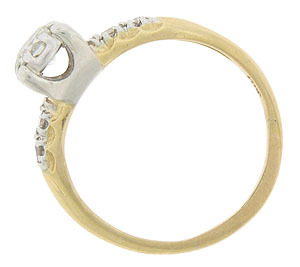 This vintage wedding ring measures 5.44 mm in width. Circa: 1945. Size 3 3/4. We can re-size.